We have an abundance of bamboo available to us, so it makes sense that we’d use it as a building material for garden projects. 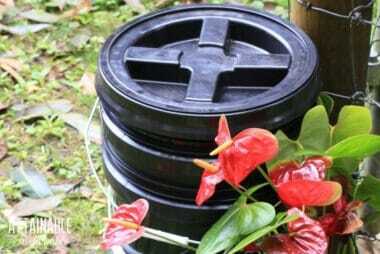 It’s sturdy, readily available, comes in a variety of sizes, and it’s free. 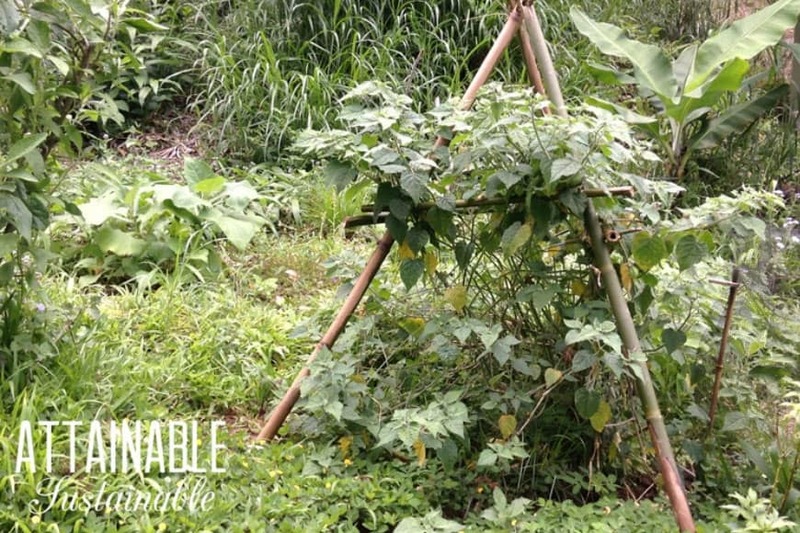 And this bamboo trellis uses a building method that’s a little bit unusual! 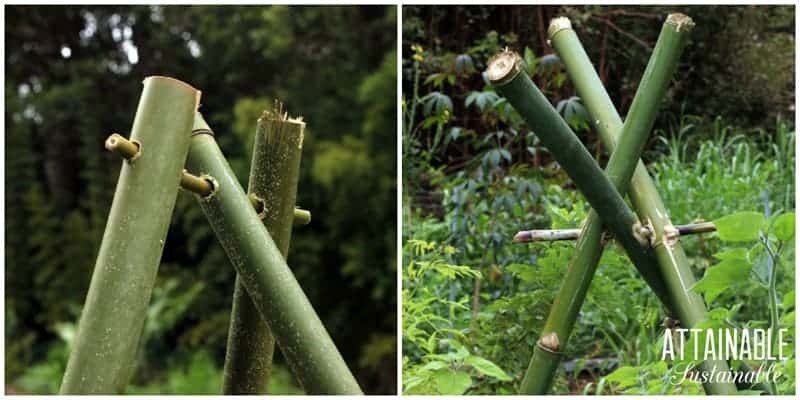 The seemingly simple bamboo trellis has given use trouble in the past, though. We’ve lashed them with jute twine. We’ve lashed them with nylon cord. And we’ve made them with baling wire. 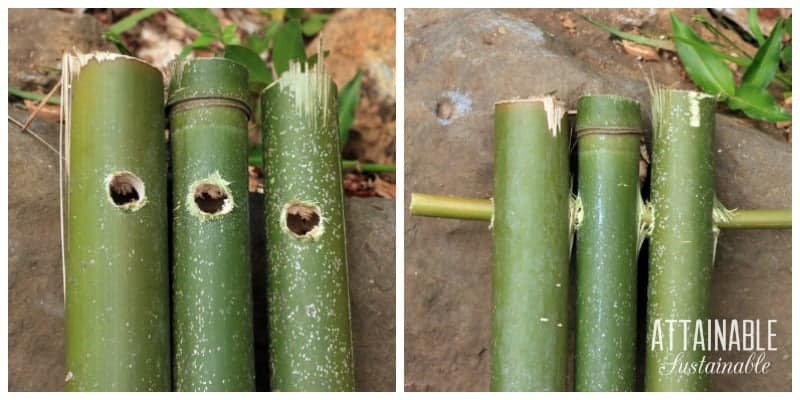 With all three methods, the binding gave out before the bamboo, falling victim to our humid climate. This generally happens when the plant climbing the trellis is at its absolute best, causing much woe in the garden. My son came up with a solution, though. 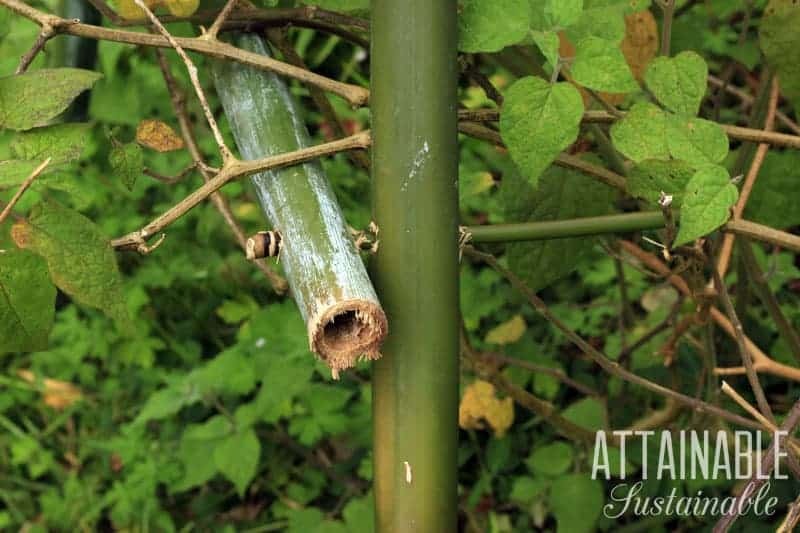 Instead of using a material that ages at a different rate than the bamboo, he figured out a way to make a bamboo trellis entirely out of bamboo. Instead of wrapping and lashing the bamboo poles, he made them with bamboo pins. 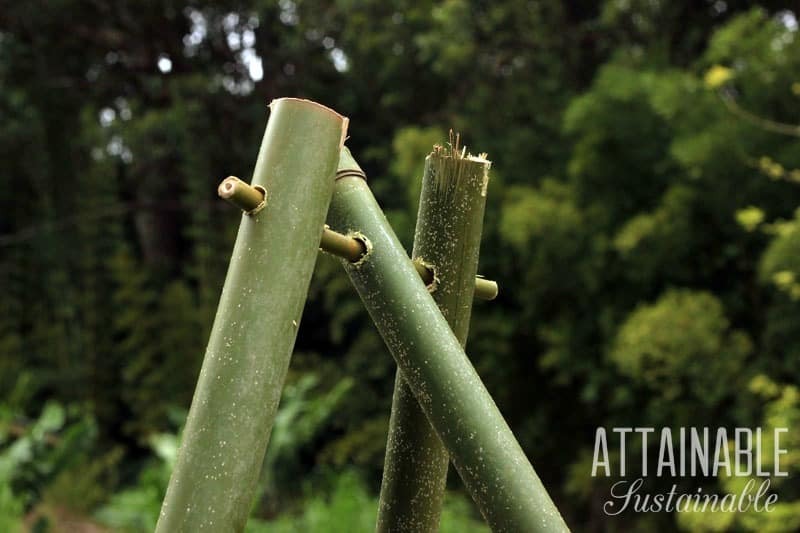 By drilling holes and inserting a smaller piece of bamboo to secure the top, as well as at the sides to reinforce it, we now have a trellis that will eventually decompose, yes, but all at the same rate. Step two: Drill a hole near the top of each pole an equal distance from the top of the pole, as shown. I used a 1/2″ drill bit here. Step four: Stand your trellis upright. Measure the distance between each set of poles, and cut a piece of bamboo (similar in diameter to your uprights) that’s about 8″ longer than your measurement to allow for overlap. Holding the bamboo in the place you plan to attach it, mark where you’ll need holes: One in each end of the crosspiece and one in each upright. Step six: Cut two pins and use them to secure the first crosspiece in place. 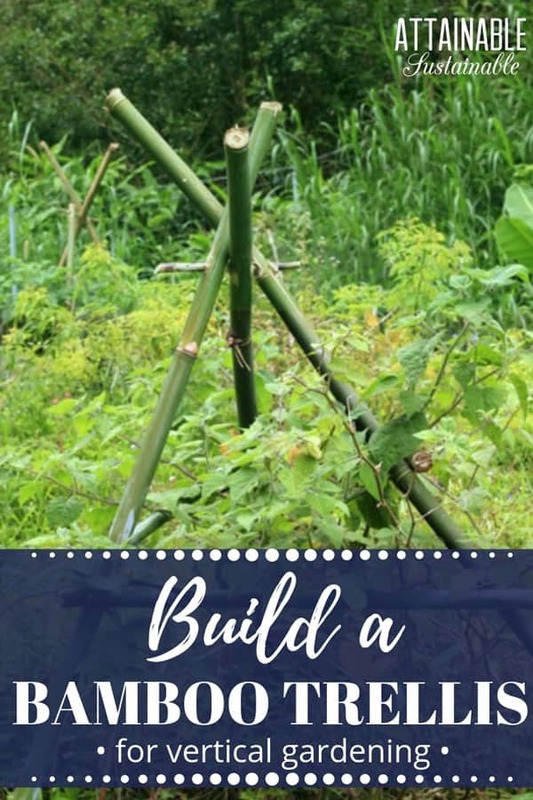 Repeat steps four through six with the two remaining sides of your bamboo trellis. 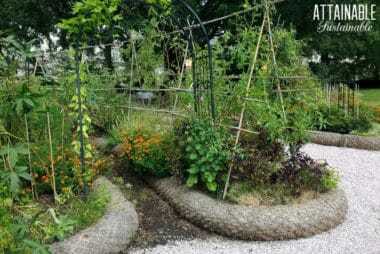 So far, we’ve only made trellises with one row of crosspieces, but you could certainly add more. Bamboo is very sturdy but you can see that it tends to shred a bit when cutting or drilling it because it’s so fibrous. A hacksaw seems to be the best way to cut bamboo for a cleaner edge, but my son cut these with a chainsaw. The rough edges don’t bother me. Need some more ideas for creating vertical growing space? Check these out! 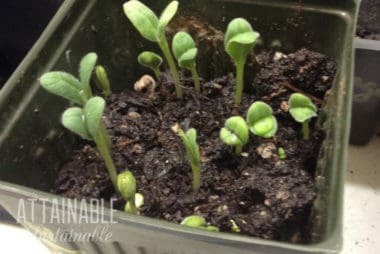 I also use bamboo everywhere (I’m in Florida) and this idea is brilliant! Can’t wait to try it out!